NTEN aspires to a world where all nonprofit organizations skillfully and confidently use technology to fulfill their missions. To put NTEN’s mission and values into a position to guide our work, support program direction, and identify community focused strategies, we created our Theory of Change. 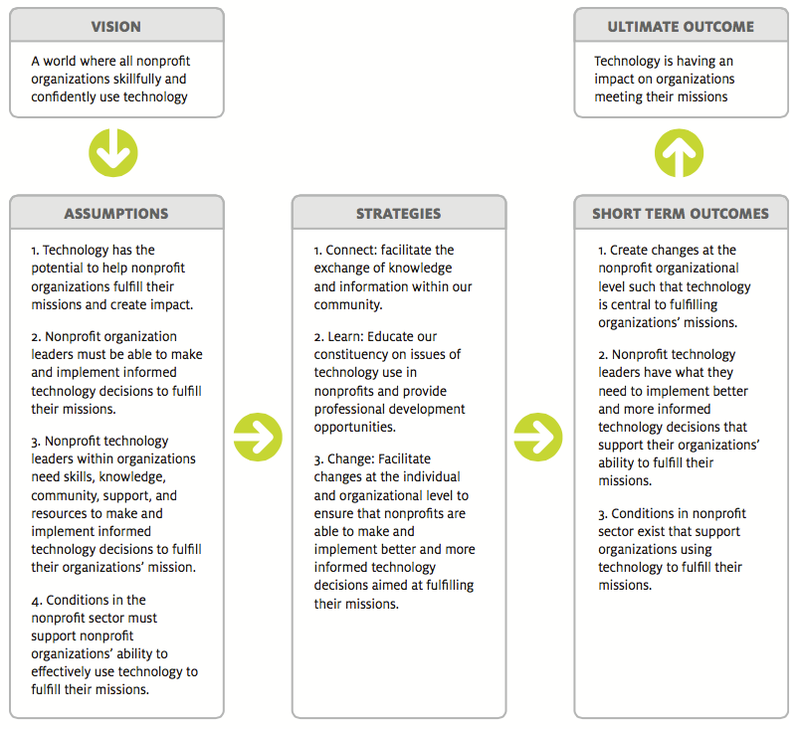 Technology is a central part of every nonprofit organization’s operations. Do organizations include technology in their strategic plans? In our annual Technology Staffing and Investment survey, we ask organizations whether technology is included in their organization’s strategic plan. We continue to see positive correlation between Tech Adoption levels, Tech Effectiveness scores, and this organizational practice. Does Technology Responsible staff have input into the strategic direction of the organization? Just as with the question above, we see a positive correlation between this practice and both Technology Adoption levels and Tech Effectiveness scores. Do organizations conduct Return on Investment evaluations? We ask organizations: “Does your organization conduct an ROI (Return on Investment) analysis or study as part of its technology investment process? For example, in determining a software, hardware, or service purchase, is an evaluation of costs and impact on the organization conducted?” and we continue to see positive correlation between Tech Adoption levels, Tech Effectiveness scores, and this organizational practice. Do organizations budget for technology-related professional development and training? With such a strong correlation between this practice (designating organizational training budget for technology-related skills and knowledge) and both TA levels and TE scores, we are pleased to see a slight increase in respondents that indicated “Yes” and decrease in those that indicated “No,” each year we conduct the Survey. Increased number of technology champions within nonprofit organizations. Conditions in the nonprofit sector exist that support nonprofit organizations using technology to fulfill their missions. How does NTEN connect with other networks and intermediaries to further our reach? Exploring this topic includes questions for us, like: “Does NTEN work with an increasing number of intermediaries, expanding our reach?” and “Do an increasing number of vendors tap NTEN as a resource for learning nonprofits’ technology needs?”. NTEN’s Membership Partnerships have expanded to include over 30 nonprofit state associations and niche membership groups, helping to diversify the partners we work with. The 2015 Nonprofit Technology Conference showcased 130 sponsors and exhibitors, representing the vendors and service providers looking to use NTEN as a path for connecting with nonprofits. NTEN is a sustainable organization, with healthy financials, operations, human resources, and cultural practices. Revenue: NTEN’s revenue is largely earned through program related income with the NTC and other year-round programs, and with annual Membership. Members served: NTEN’s membership model allows for an organization to purchase one Membership and extend benefits to an unlimited number of staff. As noted above, we hope to serve all staff within an organization in order to support our Theory of Change and reach our mission of all organizations using technology effectively. We recognize that we have a broad mission, trying to reach all types of organizations, all staff positions, and people of ranging experience levels. Our ultimate goal is that we are creating change by helping organizations truly and effectively make change towards their own missions. We’ve struggled with the idea of evaluation and just how to measure our impact when it is so deeply entwined with the work and efforts of other organizations. Since 2011, we’ve worked (internally as staff and board, with outside facilitators and consultants, and with you, our community) to identify outcomes, indicators, and discrete measurements to help us answer to the questions of what we do and if it is working. Download NTEN’s current Strategic Outlook. We plan to expand on this work at least once a year as we continue to refine questions, create appropriate mechanisms for measurement (either in collecting or analyzing data, or identifying appropriate systems for capturing information), and gather more feedback from our community about priorities and areas of need. It is critical to NTEN that the community feels directly connected to our staff and to our strategies. NTEN’s annual Community Report is a key way we receive and report back valuable input from the community that directly informs our strategic priorities for the coming year. Please take this year’s Community Survey and look for the 2015 Community Report to be published this fall.